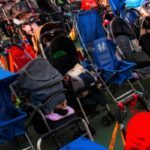 Finding a reliable tandem stroller can be frustrating. 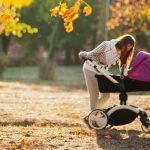 There are so many factors to consider when searching for a great stroller that will accommodate your baby as well as your growing toddler. You want something that is safe, comfortable, with convenience features to make your day smoother as you hit the town, run errands, take the kids to the park, and catch those mall sales. The last thing you want to worry about is whether your baby’s stroller might be hazardous to their health. 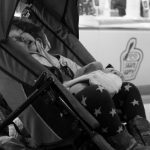 We have round up some of the best non-toxic sit-and-stand strollers for infants and toddlers so that you can leave your house feeling confident that your kids are safe and cozy. 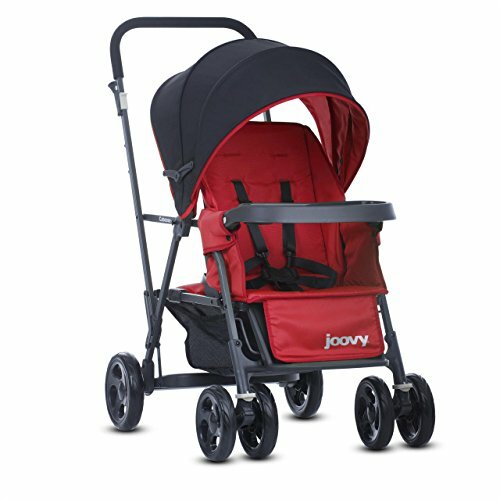 1.3 Joovy Caboose Graphite Stand On Tandem Stroller, in Red. 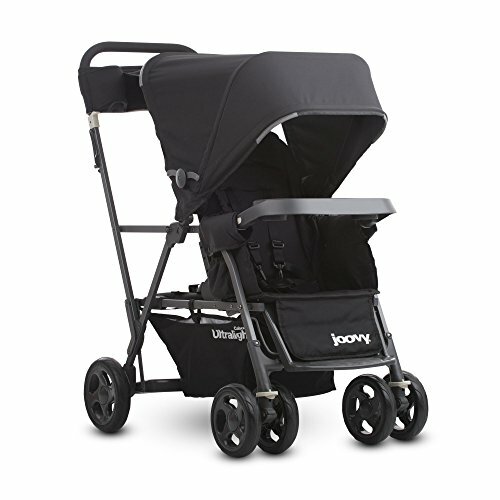 The most compact, lightweight double stroller on the market, the Joovy Caboose Ultralight is perfect for a day out shopping with your little ones. Designed to accommodate a variety of age ranges between two children, this stroller can be converted in several different ways. It includes a universal infant car seat adapter that fits most brands and a standing option for children. It is also compatible with a caboose seat that can be front or rear facing for children who are still too young to stand. Some reviewers found it difficult to manoeuver, particularly on sidewalks. This Graco stroller is great for running errands or visiting the zoo with two children up to 50 lbs. each. It is designed for the busy parent who does not have time to wrestle with bulky strollers and multiple folding steps. It is compact and lightweight and can be folded with one hand. The built-in front wheel suspension makes it a breeze to manoeuvre so that your children have a smooth, enjoyable ride. Designed for Graco Snugride Classic Connect and Click Connect car seats, so other brands may not fit as well. 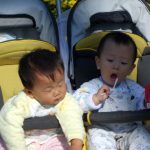 One reviewer felt that even with the Graco brand car seat, the design could not accommodate a seated child if used with an infant car seat, but other reviewers did not have an issue with getting both an infant car seat and their child to fit securely and comfortably. Joovy Caboose Graphite Stand On Tandem Stroller, in Red. 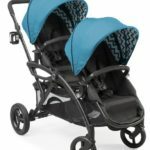 Similar to its cousin, the Ultralight, this double stroller is super lightweight and easy to move. It has a reclining front seat with three position options and a much larger sun visor than other models, making it perfect for a sunny day at the park or for running errands while your baby naps. The only storage is one small basket. This is a fantastic choice for an all-day event. It has multiple storage options as well as snack trays and cup holders in the front and back. There is even a snack tray for the adults with a pivoting cup holder for even more convenience. The front wheels swivel for ease of movement and the buckles offer three and five-point safety harnesses to help you ensure that your children are safe and secure as you go about your day. A removable face-time rear seat that holds up to 40 lbs. 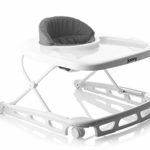 Many reviewers loved the convenience features but stated that it is difficult to manoeuvre with heavier children and it may not be comfortable to stroll if you are a tall person. We all want the best for our children. With all the things a parent has to keep track of, from soccer practice and doctor appointments to veggie intake and school paperwork, it is nice to know there are products out there that meet your convenience needs with safe, quality material that is free of toxins, such as flame retardants and lead. This gives you one less thing to worry about. 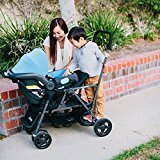 These strollers will keep your growing children secure and comfortable so you can enjoy your busy day out with the family with confidence that you’re making good decisions for their health and wellbeing.